Philadelphia Flyers mascot Gritty rebounded quickly after having his heart broken during Saturday's game against Anaheim. It happened in the middle of the first period as Gritty was bringing flowers to one of the Flyers Ice Girls, only to catch her kissing the Phillies mascot. 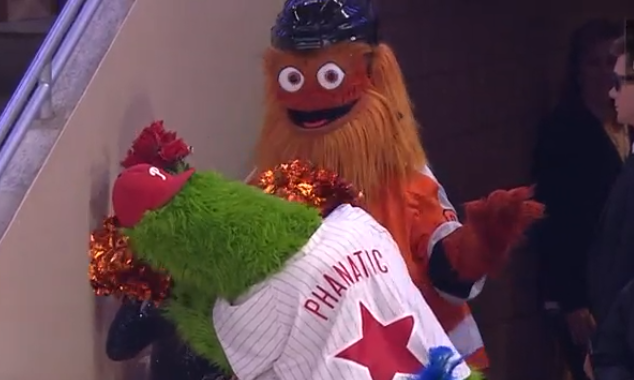 Naturally, Gritty felt betrayed by the Phillies mascot, and he tossed the flowers on the ground. However, Gritty was able to rebound by the time he ran over to the next section, as he planted a big kiss on two other Flyers Ice Girls. It's nice that this story has a happy ending with Valentine's Day coming up in just a few days. The Flyers beat the Ducks 6-2, so we know Gritty went home happy.